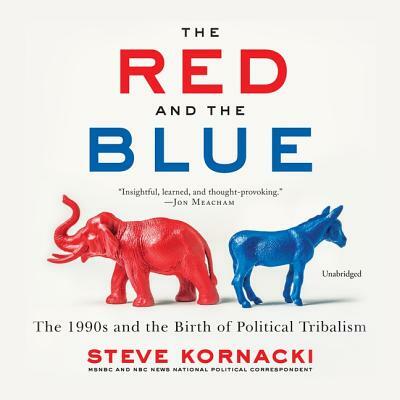 From MSNBC correspondent Steve Kornacki, a lively and sweeping history of the 1990s--one that brings critical new understanding to our current political landscape. In The Red and the Blue, cable news star and acclaimed journalist Steve Kornacki follows the twin paths of Bill Clinton and Newt Gingrich, two larger-than-life politicians who exploited the weakened structure of their respective parties to attain the highest offices. For Clinton, that meant contorting himself around the various factions of the Democratic party to win the presidency. Gingrich employed a scorched-earth strategy to upend the permanent Republican minority in the House, making him Speaker. The Clinton/Gingrich battles were bare-knuckled brawls that brought about massive policy shifts and high-stakes showdowns--their collisions had far-reaching political consequences. But the '90s were not just about them. Kornacki writes about Mario Cuomo's stubborn presence around Clinton's 1992 campaign; Hillary Clinton's star turn during the 1998 midterms, seeding the idea for her own candidacy; Ross Perot's wild run in 1992 that inspired him to launch the Reform Party, giving Donald Trump his first taste of electoral politics in 1999; and many others. With novelistic prose and a clear sense of history, Steve Kornacki masterfully weaves together the various elements of this rambunctious and hugely impactful era in American history, whose effects set the stage for our current political landscape.